This legislative session saw some victories and some setbacks in the fight to protect Maine people from toxic chemicals. The Maine People’s Alliance and the Alliance for a Clean and Healthy Maine worked to continue the momentum to phase out the chemical bisphenol-A (BPA) by supporting two important bills: LD 902, which would prevent food packaging for baby food and infant formula to contain BPA, and LD 1181, which would require large food packaging companies report the use of BPA in their products. BPA is a chemical that has been linked to a wide range of health problems, including neurological disorders and cancer. It is often used as an ingredient in food packaging and has been shown to leech into the foods with which it comes into contact. BPA is already phased out in much of the world, including Europe and Canada. 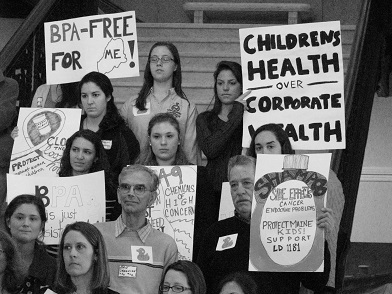 At the end of 2012, MPA worked with allies to collect signatures to initiate a citizens’ rulemaking process through the Board of Environmental Protection in order to get BPA out of baby food and infant formula packaging. Despite opposition from the LePage administration and out-of-state chemical companies, the Board voted that the chemical had no place in infant formula and baby food. The rule was then sent to the legislature as a bill, LD 902, for final approval. It unanimously passed out of the Environment and Natural Resources Committee, sailed through both the House and Senate without opposition and became law without the Governor’s signature. The other priority bill this session was LD 1181, known as the Healthy Kids bill, which was sponsored by Senate Majority Leader Seth Goodall. The bill built upon earlier legislation by requiring require food companies that make over $1 billion in sales each year to report their use of BPA (bisphenol-A) in their food packaging. Currently, not even the largest food manufacturers like Del Monte, Campbell’s, and ConAgra are required to disclose their use of BPA. Many consumers are unable to tell which products do, and which do not, contain harmful chemicals. LD 1181 would have helped parents and businesses receive good information about which foods and food packaging contain the chemical BPA. Mothers, doctors, scientists, small business owners and other advocates packed the Environment and Natural Resources Committee room to testify in support of LD 1181, with only industry lobbyists testifying in opposition. Despite passionate testimony from advocates, the bill passed out of committee without the support of any Republican legislators. As the bill made its way to the House of Representatives, advocates began a strong grassroots campaign for the bill, contacting legislators and conducting citizen lobbying. The bill passed the House with strong support and with the votes of several Republican legislators. In the Senate, the bill was passed unanimously under the gavel and was sent to the Appropriations table (because of a fiscal cost that had been attached to the bill). At the same time that LD 1181 was moving through the legislature, the Portland Press Herald published an in-depth series of investigative reports on the Maine Department of Environmental Protection (DEP) and its department head, former lobbyist Patricia Aho. The series detailed how the DEP has sided with industry interests, many of whom Aho represented as a lobbyist, and exposed Aho’s failure to fully implement laws that would affect industry interests. Armed with the recent news of corporate influence in the DEP, advocates pushed for the fiscal cost of the bill, as assessed by Aho’s DEP, to be reduced. The Appropriations Committee reassessed the cost of the bill and it was voted out of committee in a bipartisan vote. The bill worked its way back through both houses and eventually ended up on the Governor’s desk. With nine days to make a decision on whether to veto the bill, advocates wasted no time in turning up the pressure on LePage and legislators. A group of mothers rallied outside the Governor’s office calling on LePage to side with Maine children and families and sign the bill. Only hours later, Governor LePage instead vetoed the bill and sent it back the Legislature. With two members absent, the Senate was unable to muster the votes to override the veto. Despite the setback, MPA and other Alliance for a Clean and Healthy Maine organizations will be working to hold legislators accountable for voting against Maine’s children and will continue to work to strengthen Maine’s public health laws. To join MPA’s work on this important issue, please contact your local organizer.